The term dressage comes from French, and literally means train or dress. Compare horses to children going through school. When the young child first attends grade one, they can’t read or write, can’t do maths and the world is a small place. If this child was asked to prepare a paper at university level, could they? Of course not. Over the years, more and more information is added into this child’s knowledge, until, many years later, they can produce that university paper. There is a process, which can’t be rushed. Each step of each subject needs to be examined, tried and practiced until it can be reproduced. Remember, an amateur practices until they can get it right, a professional practices until they cannot get it wrong. A young horse needs to go through his education before he becomes a top level dressage horse. For the whole “syllabus” that the horse will go through, refer to the German Scales of Training. The flatwork / dressage lesson is a combination of rider coaching and horse training. (For a sample lesson, read ORBITSS in blogs and articles). Bio-mechanics remains a constant part of my coaching. However, especially with travelling and offering clinics, I often meet riders who are having a particular problem that they desperately want to address. Within reason, if someone wishes to book a particular lesson, I will endeavor to help them. Their stumbling block at this point could be that their canter transitions are lazy, that their horse lacks impulsion, their shoulder in is all neck bend and not angle, or their half pass sticks. Whilst there is no magic wand, a fresh pair of eyes and a new method of explaining can often break through the barriers. If a flatwork / dressage lesson is booked, there will still be a strong base of rider position, use of the body and staying in balance. Alongside this, I will never teach something that the rider is not ready for – if you are unstable in trot, I won’t teach you to canter. I want to keep you (and your horse) safe, and put you in a position to achieve and grow, not to fail and lose confidence. These lessons are available at any level, from a just backed three year old working on forward, straight and rhythm, through to grand prix. I will not work with any form of draw rein, but the rest of the equipment is rider choice (e.g., a jumping, general purpose or dressage saddle, a cavesson, drop or flash noseband, boots / bandages / nothing etc.). 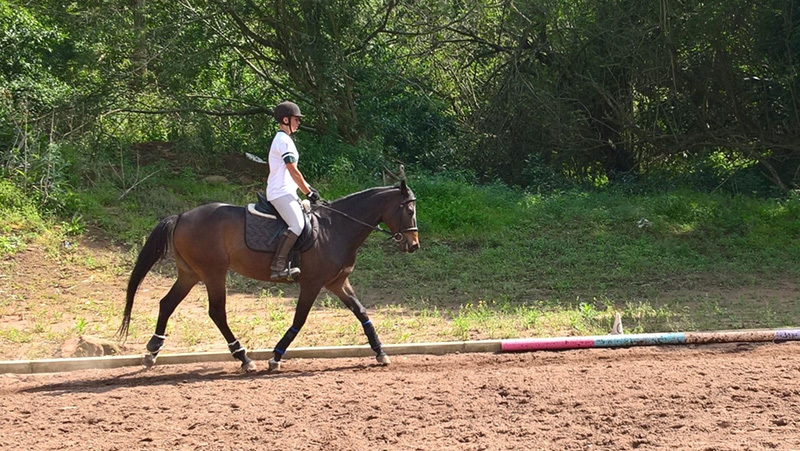 If the rider is aiming to work on a particular exercise, the horse needs to have some understanding – we are not going to teach a rider perfect half pass on a horse who can’t do travers. This can be more of a problem riding a borrowed or riding school horse.